Our Main Street Approach is centered around Transformation Strategies articulating a focused, deliberate path to revitalizing and strengthening our downtown commercial district. Each program’s work should be organized around the Four Points: Economic Vitality, Design, Promotion, and Organization. The revitalization program's will be guided by a solid understanding of local and regional market data, and sustained and inclusive community engagement. 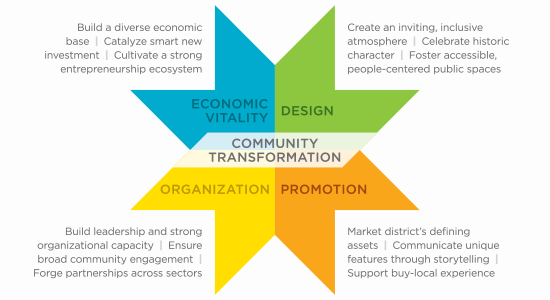 Transformation Strategies – built by thoughtful community engagement and a comprehensive analysis of the district’s market position — help guide a revitalization program. 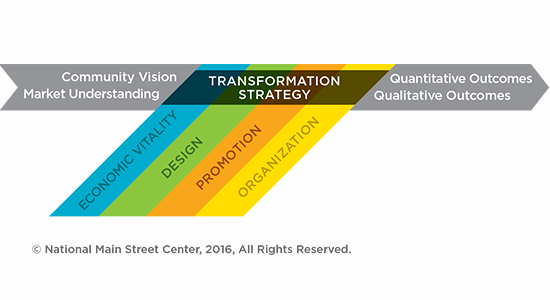 A high functioning Transformation Strategy serves a targeted customer base, boosts under-served market demands, or creates a unique destination opportunity. ECONOMIC VITALITY identifies economic and financial tools like capital, incentives, grants, and loans to assist new and existing businesses, spur new development, and foster a positive platform for entrepreneurs and investors to connect with our community. DESIGN focuses on community’s transformation by augmenting the physical and visual attributes making our downtown district unique. PROMOTION boosts the awareness of our downtown as the center of Defuniak Springs and a hub of economic activity. The aim is to create a positive image that showcases our communities unique characteristics. ORGANIZATION builds a solid base for a sustainable revitalization effort. These efforts include establishing corporate and community partnerships, vigorous volunteer programs, and economic resources for all.